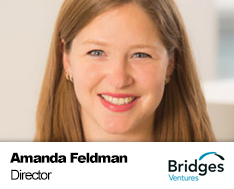 Amanda is a Director on Bridges’ Impact+ team, leading external, practitioner-led advisory work to promote the growth of the impact investment sector. She has focused her career on shaping social innovation and investment strategy with fund managers, corporations, policymakers and entrepreneurs. She is regular speaker and writer on relevant trends (see her TEDxLSE talk here). Before joining Bridges, Amanda led research and advisory at Volans on how multinational corporations can transform the way business is done, especially through corporate venturing. She brings experience in youth-led social enterprise and public health policy across North America, Europe and Asia. She currently serves on the Volans Advisory Board, the Global Corporate Venturing Advisory Board and the B Lab UK Standards Advisory Council. She is also a trustee at Future First Global, a BMW Foundation UK Responsible Leader, a mentor for the Bethnal Green Ventures and a member of the Thousand Network. She holds a B.A. in English and Spanish literature from the University of Pennsylvania and a Master in Public Administration (MPA) from the London School of Economics.